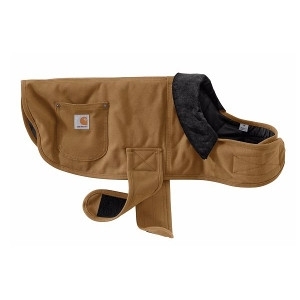 12-ounce, firm-hand, 100% ringspun cotton duck, quilted nylon lining. Corduroy-trimmed collar that can tuck inside coat. Hook-and loop closure tabs at neck & chest for adjustability. Two rivet-reinforced pockets. Carhartt label sewn on pocket.